Not many people know this but His Royal Highness was lost to the world for a few hours in 1970. Fiji had been granted independence from Britain rather more quickly than the Fijian people really wanted, but Britain's Labour Government was dropping its former colonies with all possible speed, at the behest of the United Nations and much pressure from the United States. So Fiji was next in turn for the treatment. 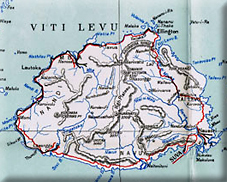 The date was 10 October 1970, 96 years after Fiji had been ceded to Queen Victoria by the chiefs of Fiji at the old capital, Levuka on Ovalau Island. Fiji's document was the "Deed of Cession" and now the Prince of Wales, representing the Queen, was returning to the scene of the original signing. The formalities over, he boarded the British frigate (HMS Charybdis) which was lying at the small wharf inside the reef at Levuka, and sailed out of the harbour into the teeth of the South-East Trade Winds. The frigate travelled outside the reef for a few miles and then into the next passage through the coral reef where Prince Charles disembarked into the Governor's official motor yacht Ramarama, on which I, as Director of Marine, was waiting to ensure his onward safe and comfortable passage through the difficult waters leading to Bau Island, the traditional home of the great chiefs of Fiji, King Cakobau (pronounced "Thakombau") who ceded Fiji to Queen Victoria, and the scene of the most awful practices of the cannibal days more than a century before. 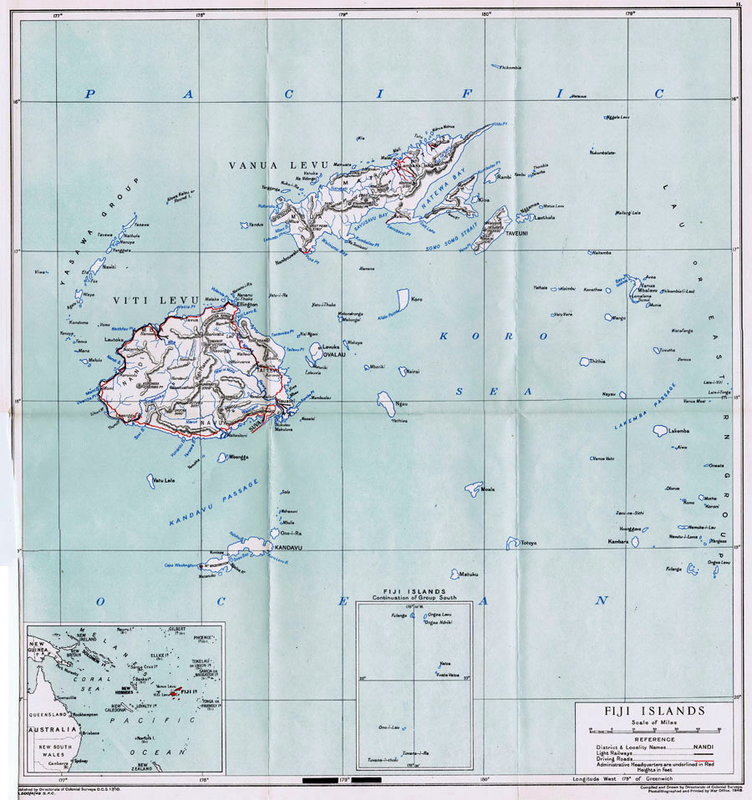 Well were the Fiji Islands known as the "Cannibal Isles" in the 18th century. The Governor's yacht anchored several miles out from Bau Island, just inside the fringing coral reef on which thundered the Pacific Ocean waves, ideal for the fish drive, so Ratu George Cakobau told us. He was the great grandson of King Cakobau, and now the Vunivalu (or Paramount Chief) of Fiji, soon to be named the first Governor-General of the new Dominion as Ratu Sir George. He was now seated in a long wooden canoe, surrounded by a fleet of other canoes, and all ready for Prince Charles to climb down and join them. We asked Ratu George to make sure that they returned to the Ramarama not later than 5.30 pm as sunset was shortly after 6.00 pm (as it is in the tropics). By now a second Government vessel had arrived and anchored with a crowd of press and TV reporters on board, who had come along specially to capture the expected quite dramatic fish drive for the world's readers and viewers. They hastily disgorged into another fleet of canoes and disappeared northwards to join the Royal fishing party many miles up inside the reef. A rainstorm crossed the scene blotting from view the fish drive party, and in fact they weren't sighted again for a couple of hours, by which time it was quite dark. Suddenly a large canoe sped out of the rain and darkness with a rather wet Prince of Wales on board, and the happy, laughing Ratu George Cakobau cheerily calling out Sa Moce (goodbye or even sleep well) as they dashed past and on into the black night towards Bau landing. We on the Ramarama had to wait for all the press and other hangers-on to return to their ship anchored nearby and then we hove up our anchors and most gingerly made our way towards the landing; a hair-raising short voyage as the winding route through all the reefs was unmarked and small boats had to be sent on ahead with hurricane lamps to show us the way. It was dead low water when we anchored off Ban Island and everybody had to wade ashore through nearly a mile of black mangrove mud. The going was hard enough for the Director of Marine in his white uniform, but harder for the members of the international press, men and women, and devastating for the men carrying TV cameras and equipment for the extra weight made them sink in the mud to their knees. Meanwhile, back in our big colonial home in The Domain in Suva, my wife was becoming very anxious because we were to be at a cocktail party for the Prince at Government House at 7.30 and it was past that time already - where in heaven's name was her husband? Then the phone rang and it was Lady Foster, the Governor's wife, anxiously asking my wife "where on earth is the Prince of Wales - have you heard anything?'' as her husband was in charge of the seagoing part of the Prince's afternoon programme. No, nothing had been heard, to which Lady Foster remarked "what wonderful news that is going to be for the Palace - Fiji has lost the heir to the throne!''. Eventually, at about 9 o'clock at night, cars were heard coming back into The Domain and my wife. Dodo, knew that the men were returning. The Prince was safely back at Government House for dinner, but the cocktail party was off. My wife took her cocktail frock off, put two chops in the oven and in through the front door came her Peter in his once immaculate white uniform, now covered in black mud, carrying his shoes and socks. He said "but you should see the reporters'', some of whom he had given a lift back to the Grand Pacific Hotel. They were fuming and in fact gave the world a great story about it next day. The Prince hardly got a mention!